Savers and investors can now breathe a sigh of relief as the Aadhaar linking deadline for various documents and services has been extended. Through notifications issued in the first half of December 2017, the government extended the linking of Aadhaar with PAN, Bank Account, insurance policies, demat accounts and other financial services that come under the Prevention of Money Laundering Act, 2002. The new deadline to link Aadhaar is now March 31, 2018. On December 15, a five-judge Constitution Bench of the Supreme Court, extended the deadline for Aadhaar linkage to March 31, 2018 only for non-Aadhaar holders opening new bank accounts. The deadline for linking Aadhaar with mobile number was also extended to March 31, 2018, from February 6, 2018. The court also extended the deadline for Aadhaar linking to avail 139 services and subsidies under Section 7 of the Aadhaar Act to March 31, 2018. The Bench scheduled the final hearing on 28 separate writ petitions challenging the very validity of the Aadhaar scheme for January 17, 2018. With the Aadhaar linking deadline now extended, many financial services companies will have time to develop and improve their systems and processes to make Aadhaar linking hassle free. Right up to the beginning of December 2017, many companies were yet to introduce an online feature for linking Aadhaar. However, for those that had done it, the Aadhaar linking system was riddled with technical glitches. Most insurance companies are yet to launch an online facility. Life Insurance Corporation (LIC) of India, was among the first insurance providers to extend an online facility for linking Aadhaar to LIC policies. LIC is one of the oldest insurers with the largest customer base. With a wide network of LIC agents, almost everyone has an LIC policy in their name. The online route will prove convenient to all LIC policyholders who are yet to link their Aadhaar. PersonalFN highlights how to link Aadhaar with an LIC policy in a few simple steps. On the homepage of www.licindia.com there will be a banner to ‘Link Aadhaar and PAN to Policy’. Click on it. 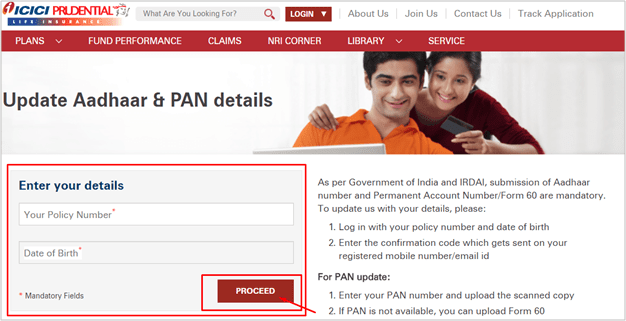 The link will take you to a page (as shown below) outlining the requirements and the process to link your Aadhaar and PAN to your LIC policy. Click on ‘Proceed’ to continue. Enter the details as asked. 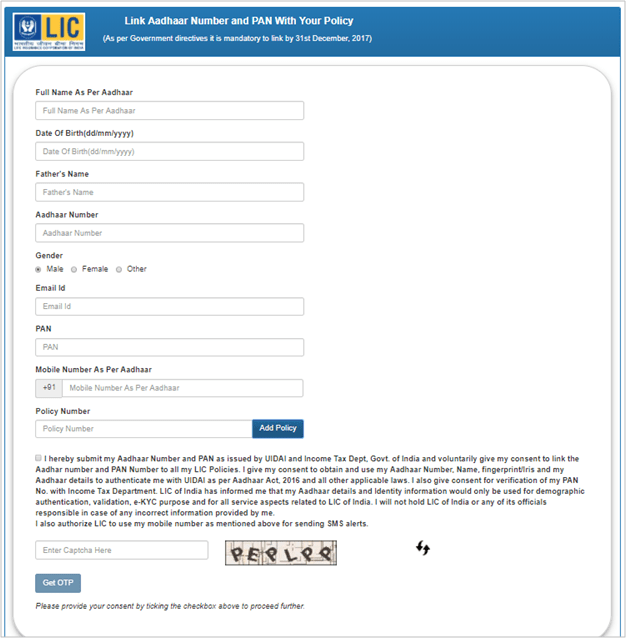 You have the option of linking multiple LIC policies by entering the policy number and clicking on ‘Add policy’. Cross check all details once and click on ‘Get OTP’. Ensure there are no typographical errors when filling the form, or else the LIC Aadhaar linking will fail. On clicking on ‘Get OTP’, the OTP received on the mobile number registered with UIDAI needs to be entered on the page, as below. After confirming the particulars of the form, enter the OTP and click ‘Submit’. 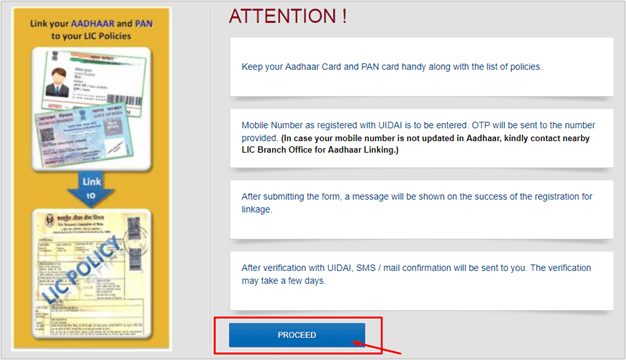 You will receive a confirmation message for the LIC-Aadhaar linking request. The LIC-Aadhaar linking request will be processed in a few days. On successful verification with the UIDAI, a confirmation email will be sent to you. Due to technical issues or other discrepancies, you may be unable to link Aadhaar to LIC policies online. If you are unable to link your LIC with Aadhaar online, you need to complete and submit this mandate: https://www.licindia.in/getattachment/Home-(1)/Online-Aadhaar-PAN-Mandate.pdf.aspx, to your LIC agent or at the LIC Branch office. All you need to do is mention the LIC policy numbers and attach a self-attested copy of your Aadhaar card and PAN card. Similar to LIC, several other major insurance providers have introduced an online facility to link Aadhaar to insurance policies. The process is similar in most cases. You can link Aadhaar to ICICI Prudential Life Insurance Policies by using this link: https://www.iciciprulife.com/services/update-your-aadhaar.html. You will need to log in with your policy number and date of birth. On the verification of these details you will receive a confirmation code on your registered mobile number / email id. On verification, in the Aadhaar tab, click on "Edit" and enter your Aadhaar number and click on “Verify”. OTP will be sent to your mobile number linked with Aadhaar. 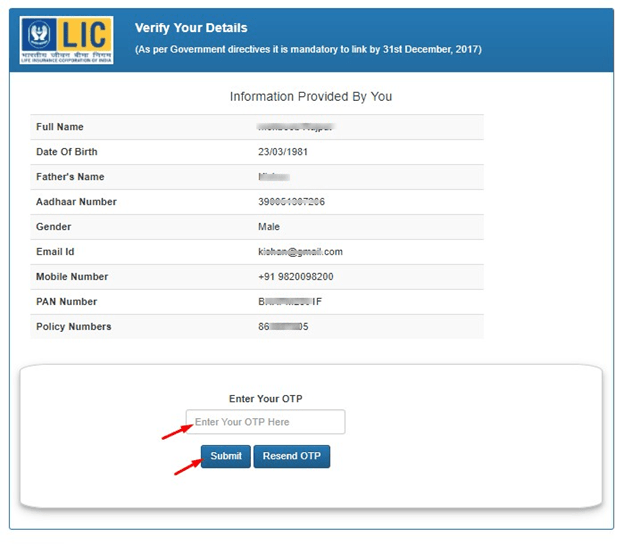 Enter the OTP and on verification, click on "Save" to link your Aadhaar number. You can link Aadhaar to HDFC Prudential Life Insurance Policies by using this link: https://myaccount.hdfclife.com/. 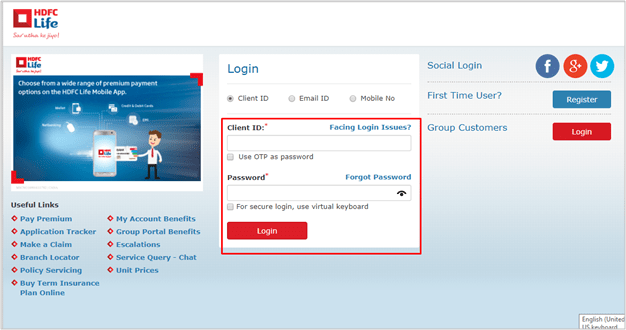 After successful login, you will get an option to view existing policies under ‘My Policy’. Here you will get an option to ‘Update Aadhaar’. Enter your Aadhaar number and click submit to complete the linking process. Some insurance providers offer Aadhaar linking without the need of an online account. For the others, you may need to login to your insurance account online to enter get Aadhaar linked. 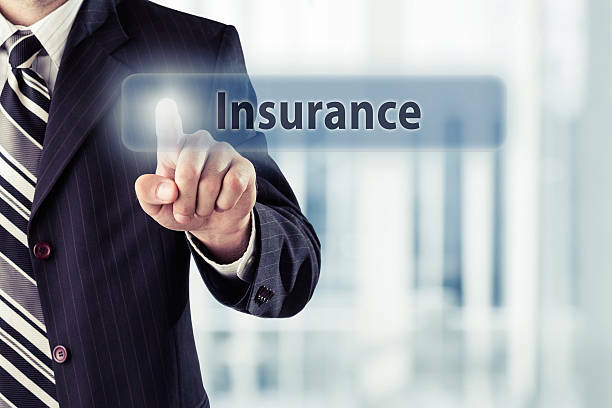 Here are the links to the online facilities of a few other major insurance companies. Many financial service providers are yet to provide a system for online linking of Aadhaar. What is more cumbersome, is that the process differs from one to the other. If the name on your policy differs from that on your Aadhaar it could lead to further delay and paperwork. Linking your Aadhaar is just a temporary phase and should not divert your mind from your ongoing financial goals and other personal finance needs. PersonalFN believes that without an optimal life insurance cover you are most probably bidding a goodbye to the dreams and financial objectives of your loved ones. To ensure that your family lives a stress free financial life even after you are gone, it would be prudent to find out whether you are adequately insured or not. Check if you are adequately insured by using this simple calculator. Many tend to underestimate their insurance requirement. Are you one of them? Find out here. At PersonalFN, we are committed to providing you unbiased and honest views and opinions on various personal finance issues that can affect your investments and finances. We have been providing personalised Financial Planning solutions to our clients in India as well as to NRIs so as to help them meet their financial goals and objectives.